In one of those under-the-radar moves that can sometimes sneak by during the dog days of the hockey offseason, Scott Gomez signed with the Florida Panthers last week. Given his diminishing production during the last few years, it wouldn’t be a surprise if Florida wound up being the last stop of Gomez’s career. Gomez won’t be the only veteran suiting up for a new franchise in what could be his final season; Daniel Alfredsson and Jaromir Jagr will also be joining new teams next year. And while it’s always jarring to watch a veteran finishing his career in an unfamiliar uniform, it’s become an increasingly common sight over the years. In fact, many of the biggest stars of the past few decades actually finished their careers by playing one season (or less) for a new team. A few times, it turned out well. Other times, not so much. And in some cases, hockey fans might not even remember where a superstar wound up playing his last few games. Here are 17 players who finished an excellent NHL career with a brief and often forgettable change of scenery. You remember him as: Easily the greatest player in Minnesota North Stars/Dallas Stars franchise history. How it happened: In what’s probably the closest parallel to the Alfredsson situation, Modano spent his entire career with one franchise before spending one final season in Detroit. But unlike Alfredsson, he didn’t blindside his old team — it was the Stars who made the decision to part ways, informing Modano they wouldn’t be re-signing him heading into the 2010 free-agency period. Unwilling to retire, Modano signed with his hometown Red Wings instead. He played just 40 games, recording four goals and 15 points and producing lots of shots like this that still look Photoshopped, before retiring after the season. You remember him as: One of the greatest players in Toronto Maple Leafs history. He ranks among the franchise’s career leaders in goals, assists, and points, and his 10-point game against the Bruins still stands as the league’s all-time record. How it happened: After a falling-out with Leafs owner and all-around horrible human being Harold Ballard, Sittler was dealt to Philadelphia in 1982, where he continued to play well for parts of three seasons, including an All-Star appearance in 1982-83. According to Sittler, the Flyers had decided to name him captain on the eve of the 1984-85 season. But when he showed up for the announcement, he was told by rookie GM Bobby Clarke that he was being traded to Detroit instead. A devastated Sittler went on to have the worst season of his career, announcing his retirement at the age of 34. You remember him as: The league’s first Swedish superstar, the greatest defenseman in Maple Leafs history, and the man responsible for the hockiest hockey photo of all time. How it happened: You might be noticing a pattern here. Yes, it’s yet another future Hall of Famer who finished his career with a single-season stint in Detroit. While three of the Red Wings’ all-time great players — Steve Yzerman, Nik Lidstrom, and Alex Delvecchio — played their entire careers in Detroit, the franchise has never been shy about poaching other team’s long-time players. 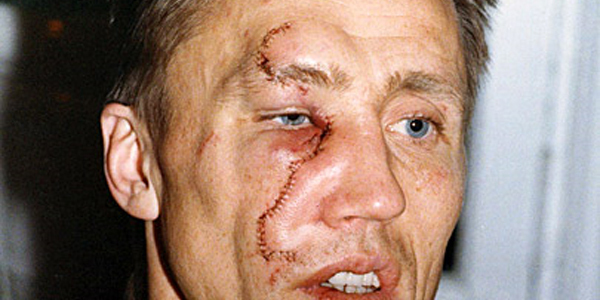 In Salming’s case, he signed with the Red Wings in 1989 after 16 years in Toronto. He played just 49 games and failed to break 20 points for the first time in his NHL career, but he did record a +20 that was his best mark since the late ’70s. He retired from the NHL after the season, but continued to play in Sweden and represented the country at the 1992 Olympics. You remember him as: The long-time Rangers defenseman. He won the Norris Trophy as the league’s best blueliner twice, was rookie of the year in 1989, and won the Conn Smythe during the Rangers’ memorable Cup run in 1994. But he finished with: The Detroit Red Wings. Wait, sorry, force of habit. It was the Boston Bruins. How it happened: Leetch’s time in New York came to an end as part of a Rangers fire sale at the 2004 trade deadline. He was dealt to Toronto for a package of picks and prospects, but played just 28 games as a Maple Leaf before a lockout wiped out the 2004-05 season. Once the league resumed, he signed a one-year deal with Boston and played well, despite being 37. He toyed with a comeback the following season before announcing his retirement in May 2007. You remember him as: The face of the Hartford Whalers/Carolina Hurricanes franchise, who also won two Stanley Cups during a mid-career stopover in Pittsburgh. How it happened: Francis was 41 years old and well into the “unproductive but inspirational veteran” phase of his career when the Hurricanes decided to trade him to a contender for one final run at a title. That ended up being the Maple Leafs, a veteran team that was loading up (they’d acquired Leetch just days before) and had hopes that Francis could rediscover his touch and help them to a long-awaited Stanley Cup. Given that this is the Leafs we’re talking about, it won’t surprise you to learn that it didn’t work out. Francis put up 10 points in 12 regular-season games in Toronto, but ran out of gas in the playoffs as the Leafs were eliminated in the second round. In a series-ending loss that would end up being the last game of his NHL career, the Maple Leafs made Francis a healthy scratch. You remember him as: The man who scored more NHL goals than anyone other than Wayne Gretzky and Gordie Howe. He debuted with the Flames, made his name with the Blues, and then won Stanley Cups in Dallas and Detroit. How it happened: Hull signed a two-year deal with the Coyotes in 2004, joining the same franchise that had retired his father Bobby’s number (from his time as a Winnipeg Jet). The first year of that deal was wiped out by the lockout, and when play resumed in 2005, it was clear Hull had nothing left. He played just five games in Phoenix, recording one assist, before announcing his retirement. You remember him as: The Hall of Famer and Vezina winner who Gretzky has called “the best goalie that ever played.” He won four Cup rings with the Oilers dynasty of the ’80s, before moving on to stints in Toronto, Buffalo, Los Angeles, and St. Louis (where he established an all-time record by starting 79 games in a single season). He gained a reputation as hockey’s Jack Morris, putting up decent stats but always racking up wins, and is one of only 10 members of the NHL’s 400-win club. How it happened: With Fuhr about to turn 37 and clearly on the downside of his career, the Blues dealt him to the Flames for a draft pick. He struggled through a year spent mostly as a backup to Freddy Brathwaite, playing just 23 games and winning only five. But Fuhr is also credited with mentoring a young Jean-Sebastien Giguere, who went on to become a star in Anaheim. You remember him as: Gretzky’s high-scoring linemate, first in Edmonton and later in Los Angeles. How it happened: It’s hard to imagine Kurri without The Great One by his side, but his career didn’t end with the Kings’ 1996 fire sale that saw Gretzky dealt to the Blues. A few weeks after that trade, Kurri was sent to New York in accordance with the league’s longstanding “every member of the Oiler dynasty had to eventually play for the Rangers” bylaws. The 1996-97 season saw Kurri sign with the Mighty Ducks, where his 35 points was good enough for fifth on a team that featured Teemu Selanne, Paul Kariya, and not much else. That was followed by a year in Colorado, where the 37-year-old Kurri struggled through a 22-point season. He announced his retirement following the team’s first-round loss to the Oilers. You remember him as: Quite possibly the greatest player in Toronto Maple Leafs history. But he finished with: I don’t want to talk about it. How it happened: We’ve covered the circumstances of Sundin’s departure from Toronto before. His refusal to waive his no-trade clause and his convoluted “October through June” moral code made for a messy divorce from the team where he’d spent 13 seasons. His half-season in Vancouver saw him put up 28 points in 41 games, decent numbers but well off his career pace. He battled injuries during the Canucks’ postseason run, appearing in just eight playoff games before Vancouver was eliminated in the second round. Sundin toyed with the idea of returning for another year in 2009 before officially announcing his retirement that September. You remember him as: The greatest goaltender in Washington Capitals history. How it happened: Kolzig spent parts of 16 seasons with Washington, setting the franchise’s all-time record for career wins with 301 (no other Capital has managed even half of that). He led the team to its only Stanley Cup finals appearance in 1998, and won the Vezina in 2000. But in 2008, the Caps decided to part ways with the 38-year-old veteran and he signed with the Lightning as a free agent. He played only eight games before suffering an arm injury that would end his career. In an added twist, Kolzig technically finished his career as a Maple Leaf — despite being injured, he was traded to Toronto in a shady deadline deal that saw the Leafs essentially buy a draft pick from the Lightning. You remember him as: The Hall of Fame center who starred with the Blues during the 1980s. But he finished with: Oh good, it’s the Red Wings again, I was getting worried about them. How it happened: Yes, it’s yet another superstar ending his career with Detroit, this time as part of a trade. And it was a memorable one — the Blues sent him and Tony McKegney to Detroit in exchange for Adam Oates and Paul MacLean, in a trade that often shows up on lists of the league’s all-time most lopsided deals. Federko struggled for ice time in Detroit and put up disappointing numbers. After the season, he announced his retirement at the age of 34. You remember him as: One of history’s greatest playmakers, especially with the Blues and Bruins. He also had strong stints in Detroit and Washington. How it happened: After his stint with the Capitals ended at the 2002 trade deadline, Oates spent the final few years of his career with several short stops that you probably have no recollection of. He finished the 2001-02 season with the Flyers, then signed with the Ducks for a season and was part of their surprising run to within one win of the Cup in 2003. He was still unsigned when the 2003-04 season opened, and his tenure in the league seemed over. But the Oilers offered him a contract in mid-November, and he went on to record two goals and 16 assists over the final 60 games of his NHL career. You remember him as: One of the greatest American players in league history, who put up record-setting offensive numbers with the Sabres and Jets. But he finished with: The Toronto Maple Leafs, though that might be news to even the most die-hard Leaf fans. How it happened: The second half of Housley’s career saw him move around constantly, including stints with the Blues, Devils, Capitals, Flames (twice), and Blackhawks. But his final NHL stop was actually with the Maple Leafs, who acquired him for future considerations at the 2003 trade deadline. He’d play just one regular-season game for the Leafs, and three more in the first round of the playoffs. His final total as a Maple Leafs from those four games: no goals, no points, and a -4 rating. He never played another game, and officially retired in 2004. You remember him as: The pesky center who starred in St. Louis and Calgary before emerging as one of the league’s best players with the Maple Leafs in the early ’90s. How it happened: OK, technically Gilmour shouldn’t be on this list, since he ended his career with a Leafs team that most fans already associate him with. But I’m going to make an exception and include him just for sheer pathos. After departing Toronto in 1997, Gilmour spent six years bouncing around the league. He had stops in New Jersey, Chicago, Buffalo, and Montreal (where he gave us this memorable moment). At the 2003 deadline, the Canadiens agreed to send him back to the Leafs. It was a great story — the long-lost captain returning to help his former team make a run at the Stanley Cup. The hockey gods apparently missed the memo. His dramatic Leafs comeback lasted just five shifts, as a freak knee injury ended his career. If you’re keeping track at home, the 2003 Leafs acquired two veteran superstars who combined to play four and a half games for them. Ladies and gentlemen, the Toronto Maple Leafs! You remember him as: The excellent and, um, eccentric Hall of Fame goaltender who was an All-Star for the Blackhawks, Stars, and Maple Leafs. How it happened: Florida wasn’t the shortest stop on Belfour’s résumé — that would be his 13 games with the Sharks in 1997 — but it would be the last. He was actually pretty darn good as a Panther, putting up a 27-17-10 record and .902 save percentage at the age of 41. Belfour wasn’t done yet, signing on with Leksands IF of the Swedish second division. He played well there, too, before finally calling it a career. He currently stands as the third-winningest goalie in NHL history. You remember him as: The longtime Hab, Blackhawk, and Red Wing who played well into his late 40s, recording more games played than any other defenseman in NHL history. How it happened: Chelios’s stunning longevity saw him playing effectively for the 2008 Cup-winning Red Wings at the age of 46. But time seemed to finally catch up with him the following year, when injuries limited him to 28 games. The Red Wings announced that they wouldn’t be re-signing him, and when no NHL teams offered him a contract his career seemed to finally be over. That’s when things got strange. Rather than retire, Chelios announced his intention to keep playing in the minor leagues. With no job prospects in the NHL, he agreed to sign a 25-game tryout contract with the AHL’s Chicago Wolves. When that deal expired, he signed another tryout, playing a total of 46 games for the Wolves. He was the oldest player in AHL history, and — with the exception of a 2008 conditioning stint — it was the only minor league action of his career. In March 2010, Chelios signed a two-way deal with the Atlanta Thrashers. After clearing waivers, he returned to the NHL on March 11. He’d play just seven games with the Thrashers, recording no points, before returning to the minors at the end of the season to join the Wolves for their AHL playoff run. Chelios finally retired in August 2010, at the age of 48. You remember him as: One of the greatest defensemen in NHL history, quarterbacking such offensive powerhouses as Gretzky’s Oilers, Mario Lemieux’s Penguins, Gretzky’s Kings, and Yzerman’s Red Wings. But he finished with: Basically everyone. How it happened: For many fans, the memories of Coffey start to fade after his mid-’90s stint with the Red Wings, but he had a lot of hockey left. You may remember his two years as a Flyer that included a pair of All-Star appearances and a trip to the 1997 Stanley Cup finals. But he also mixed in 20 games with the Whalers (he was part of the Brendan Shanahan trade), 10 games as a Blackhawk, a season and a half in Carolina, and 18 games with the Bruins. That run with the Bruins would be his last. He was released in December and retired.